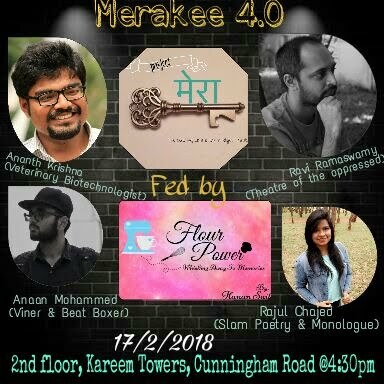 Ravi Ramaswamy has been invited to speak at an event called Merakee .Merakee is a group started by students and others of Mount Carmel College and CMS Jain . Merakee is a platform that serves to showcase people's talents, experiences, knowledge and wisdom. In a world where not everyone has access to a stage, Merakee believes that as many people as possible ought to be given a chance to express themselves and teach one another. Merakee hopes to create a space for networking where interesting and interested people can come together and make art, knowledge and information available to more people.